TGIF! This week went by like a crazy whirlwind at work. Every night I came home so exhausted, I didn’t even have energy to stand in my kitchen. This weekend we are going camping, but I haven’t even started packing yet. The weather should be beautiful, so hopefully I will come back feeling refreshed and ready for next week! Every Sunday I like to make something yummy to get me through the work-week. 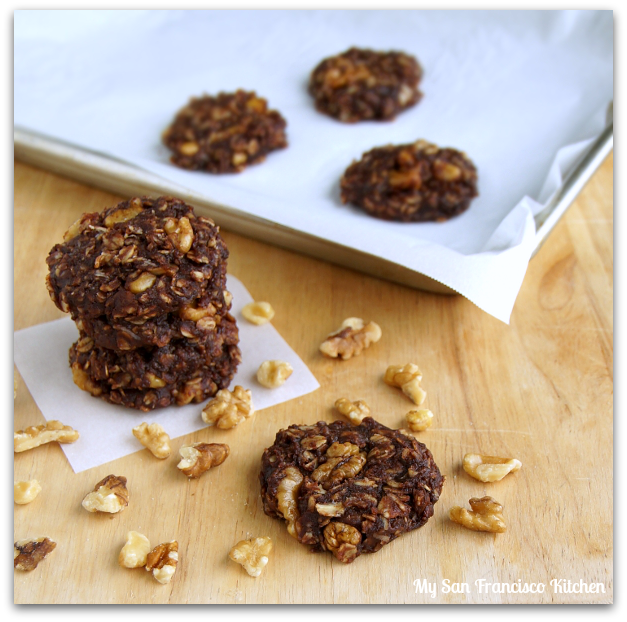 This past Sunday, I made these no-bake chocolate coconut walnut cookies. They are so easy to make, no oven required! All you need is a stove-top or microwave to heat up the ingredients, stir, shape and refrigerate. They are good for a week when stored in an airtight container in the refrigerator. Even though they have a fairly high calorie count per cookie, they provide healthy antioxidants (cocoa), fiber (oats), protein (peanut butter and walnuts), and omega-3 (walnuts). I like to eat one of these when I am low on energy and need a pick-me-up. They don’t last very long though!! By the way, my friend Louise over at Healthy Recipes Magazine is offering all My San Francisco Kitchen readers a free 3-month subscription to the magazine. Click here to get started on cooking some healthy recipes in your kitchen! Special thank you to Louise & all at Healthy Recipes Magazine. Add butter, milk, honey/maple syrup and cocoa to a small sauce pan and heat on medium until butter is melted. Stir well. Add the peanut butter, vanilla, and oats. Stir well. 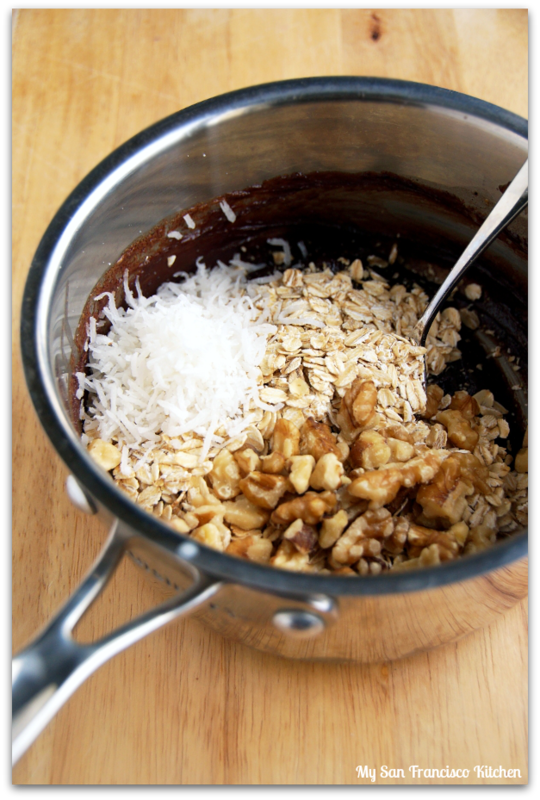 Remove from heat and stir in walnuts and shredded coconut. If they are too dry, you can add a little more milk or peanut butter; they should be wet enough to hold together, but not too wet where they won't hold their shape nicely. Line a baking sheet with parchment paper and drop teaspoonfuls of the dough onto the baking sheet. Flatten with the back of a spoon and shape with your hands into a cookie, with desired thickness. Chill in the refrigerator (best result is at least 2 hours, but you can eat them before!). This entry was posted in Breakfast, Chocolate, Dessert, Organic, Snack, Vegetarian and tagged chocolate, cocoa, coconut, cookies, no-bake, oats, peanut butter, walnuts. 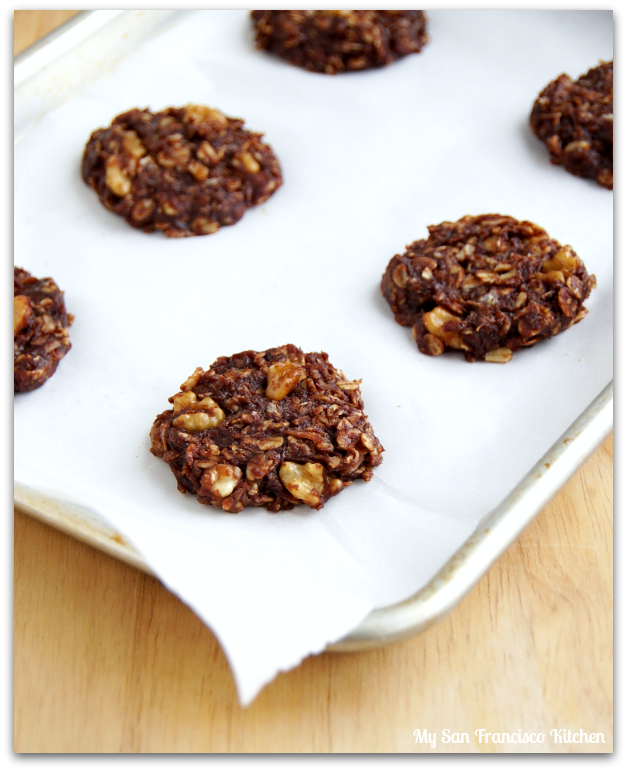 Ooh I love a good no bake cookie! These look incredible, I love all the flavors! This is a very welcome recipe! Healthy indeed and those are good calories. Thanks for always sharing great and useful content here. No bake cookie? Count me in! These look terrific. Hope you had a great camping trip! I am going to make these tonight! 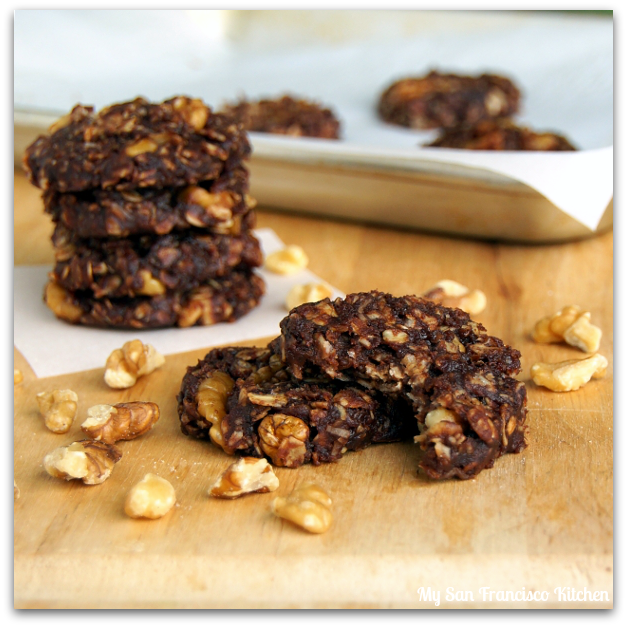 thank you for posting a gluten free no bake cookie recipe. If you lived a little closer, I would give you a hug. You made my day. Did you see that this recipe is almost viral on pinterest? Well I am going to pin in too! I love no-bake cookies. Well I guess I’ve never tried them so I love the idea of them haha! These look fantastic. These look incredible and simple – thanks! No-bake cookies are perfect for summer!! I live north of SF, and it’s typically 90°+ every day of the summer. At least 100°+ for 10-20 days too. Not fun! 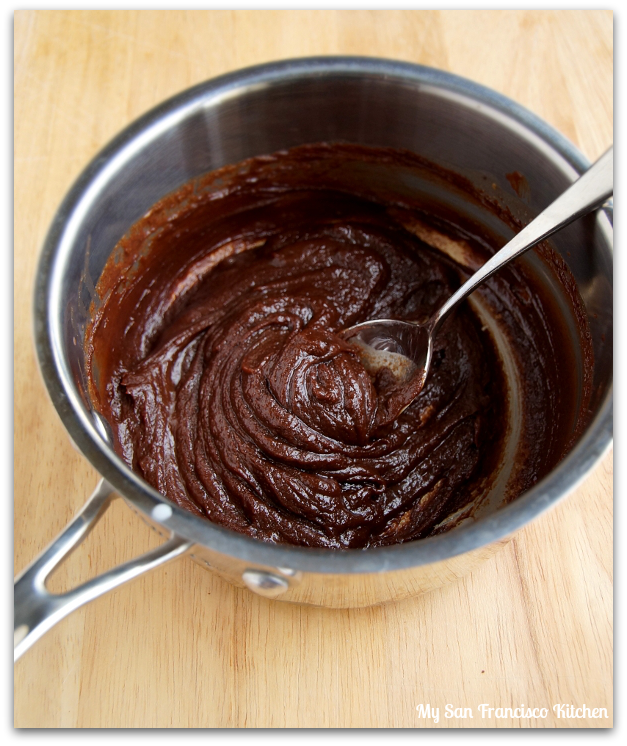 What a great recipe….it’s healthy and gluten free…I can’t wait to try this sweet treat!! Going to make these, looks yummy and healthy too and no bake, right down my alley. Could you please post the nutritional values when you post a recipe? This would help us diabetics tremendously. Thank you. that would normally be responsible for keeping you safe while the other body parts are moving.